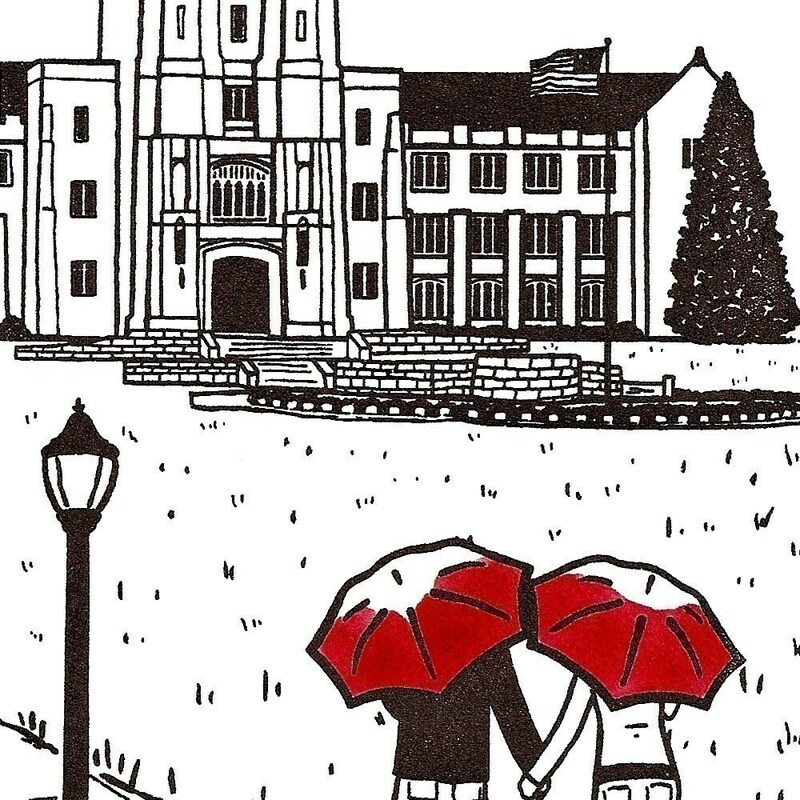 This gocco screenprint is the third in my new "College Love" series, and features a couple walking along Virginia Tech's drillfield near Burruss Hall under their red* umbrellas (please note, the print comes with red umbrellas unless you request otherwise in the "note to artsharkdesigns" box in your cart during checkout. See the end of this listing for more information). This print is hand printed from an original illustration, and the red* umbrellas are individually painted with watercolor (please allow for some minor variations, as each one is individually printed and painted). The image size is approximately 5.75 x 3.5 inches on white Stonehenge paper. The total paper size is approximately 9 x 6 inches. I know the paper size is unusual, but never fear, you don't need a custom framing job, an 8x10 inch frame with a standard white 5x7 mat looks great! I usually buy mine from Michael's craft stores, where they sell simple black frames with the mat already included (these are the frames my prints are pictured in). Each print is signed and titled "Virginia Tech Love." *I can also make the umbrellas a different color, including VT orange and maroon, as seen in the last picture. If you'd like them red, orange, maroon, or one orange one maroon, just choose from the drop down box. If you'd like some other color, choose the "custom" option and let me know in the box titled "note to artsharkdesigns" during checkout. I can make them any color that is possible with watercolor (ie. no metallics). A perfect engagement gift for two Hokies. Thank you! Seller was very responsive and easy to work with! Shipping was very fast! I love the print and can't wait to give to my friend at her bridal shower this weekend!